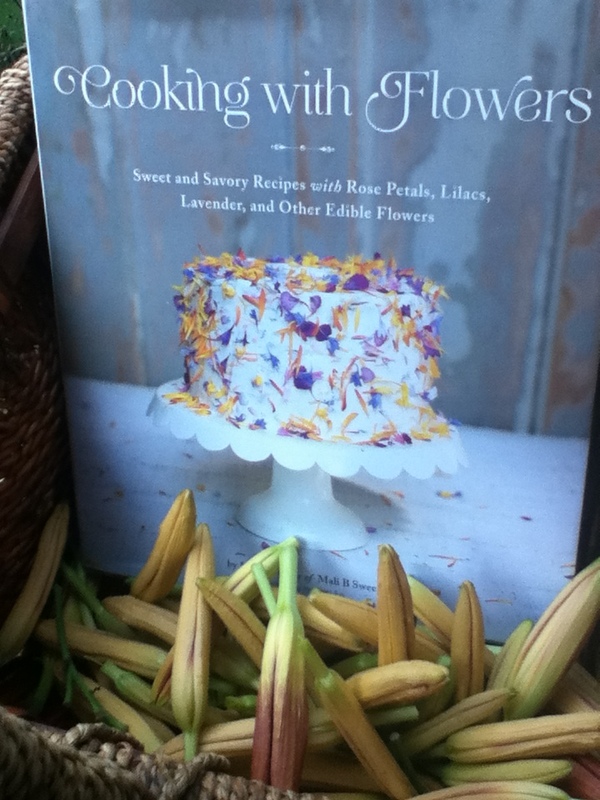 I recently won this delightful cookbook, “Cooking with Flowers” (through a giveaway on Phickle). 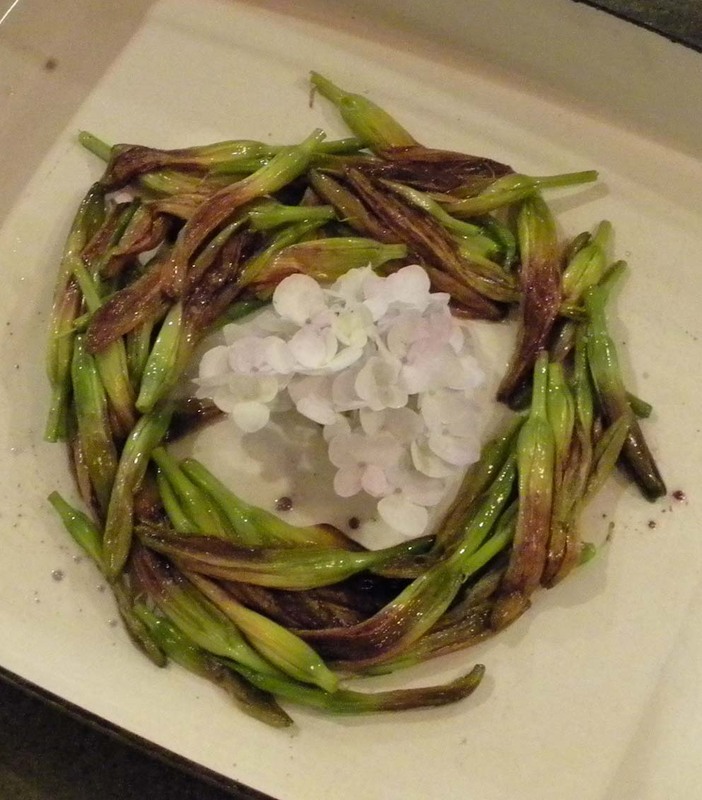 A recipe for roasted daylily buds caught my eye – not just because we have a yard full of the flower, but because it was said that the roasted buds resemble roasted asparagus in taste. I always feel that the end of asparagus season sneaks up on me – sure, I know it’s coming, but every year I find myself just a little bit saddened by it. I always want more one taste to carry me through until next year. Finding myself home alone on a Friday night with a last minute invite to a neighbor’s for dinner, I didn’t want to show up empty handed. It dawned on me that my day lilies were winding down and if I was going to try this recipe, this might be the perfect time to do so. So I ran around my yard, collecting buds from the patches of daylilies to carry with me. The recipe could not be easier. 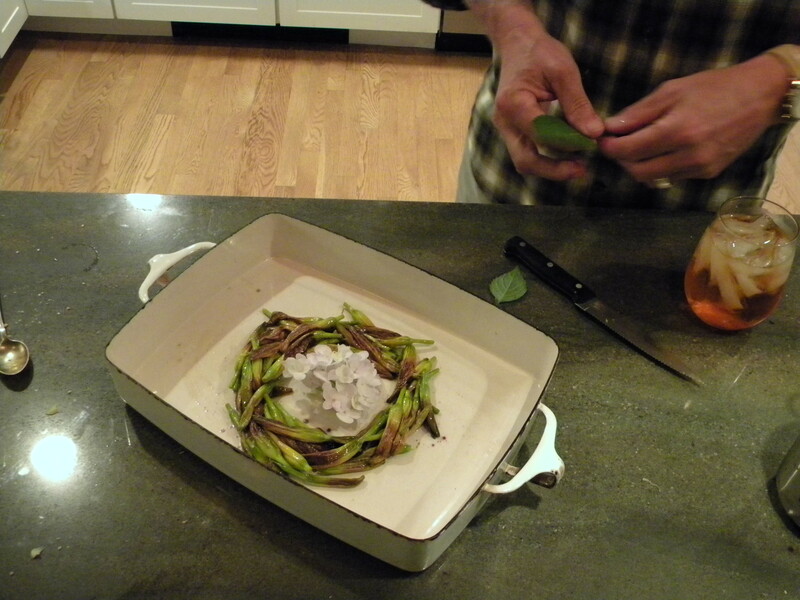 Toss the buds with olive oil & salt, roast in a 400 degree oven for 5 minutes. Jerry took over from there, styling the results into a far more pleasing presentation than I generally concern myself with. He even ran out to the garden and plucked a small hydrangea bloom with which to garnish. This is why he’s a personal chef & caterer and I am merely a cook. I don’t care about presentation as long as it tastes good. Jerry makes it taste AND look good. 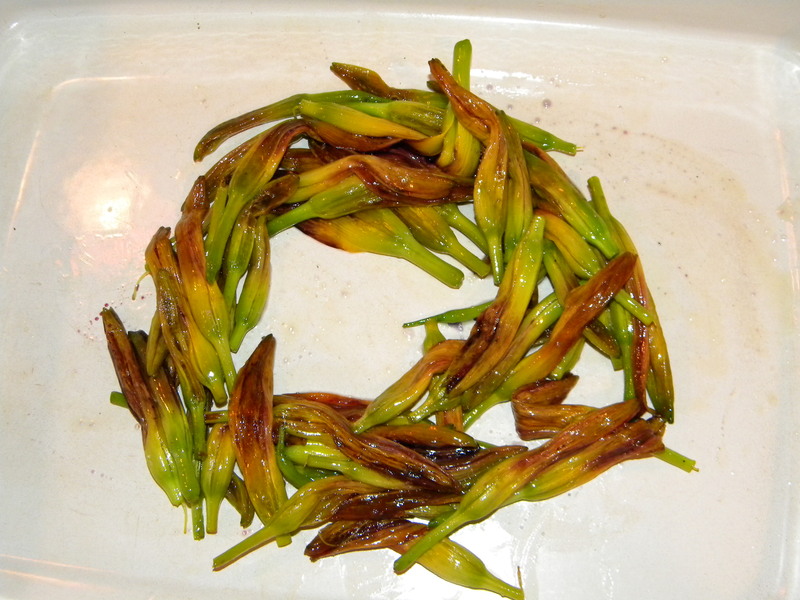 Roasted daylily buds do resemble roasted asparagus, although they are a bit more delicate in flavor than the vegetable. When next spring rolls around and I find myself at the farmers market one lovely spring morning with the stark reality that asparagus season has come to a close yet again, I can come home and comfort myself with that one last taste, straight from my own garden. Hmmmm…I didn’t grow a garden this year or perhaps I did! I can go round up my bounty now and cook a dish from my garden! I surely did not know those were edible or tasty! There are more daylily recipes in this cookbook in addition to other edible florals. I’m definitely inspired by it! Wow! I think I always assumed that daylilies were poisonous. Good to know. Yum! Excited to try that out next year. They sound great and look beautiful. Thanks for the shout-out, too!